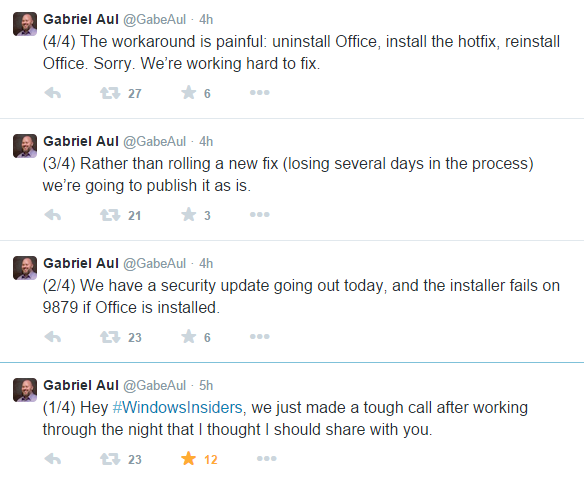 Microsoft’s Gabriel Aul, one of the most prominent members of the Windows 10 team, announced today that a security update to the current build of the operating system will not install if a user has Office already installed. The company also released a more technical explanation here. Note that you might not have to do the Office dance to get the new code, so try to update without doing so. But if it doesn’t work, this is what to do. Windows 10 is a different sort of project for Microsoft — the company is working on its new operating system quite publicly, soliciting advice earlier than it did in previous versions. Ship code sooner and more rapidly, however, and you have more issues. The above problem isn’t too surprising, or difficult, but it does underscore Microsoft’s current development pace. Microsoft is not releasing a new build of Windows 10 this year, but smaller updates are fair game it seems. Windows 10 will bring all screen sizes, form factors, and app environments for Microsoft if it pulls off its larger vision. The company will unveil a new, consumer-focused version of Windows 10 in January that may detail how the code will handle switches between user input sources. For now, if you’re on Windows 10 (I wrote this post on a Windows 10 machine I’d like to note) and you want to get the latest on the security side, you should check your build number and make sure you’re up to date. Oh and someone tell Gabe that the cool kids do it 1/, not (1/4).